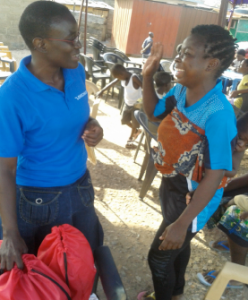 Providing basic childcare items to less privileged families in Ghana is what LoveChild is all about. With the idea that these item’s won’t just make the children happy, but that this will also allow the families to spend more money on food. Besides that, workshops and educational programs are organized for young adult women, so they can develop themselves and start earning a more stable income. 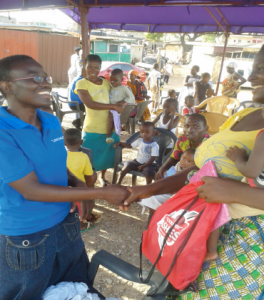 With the help of volunteers, beneficiaries who needed the support the most were selected – for example Obayaa Osei, a 32 year old single mother with five children. Obayaa has always wanted to be a hairdresser, but was not able to enroll at a hair saloon as an apprentice. Instead, she was now trading on the street to support herself and her children. LoveChild registered her for training sessions and gave her packages of basic childcare items for her children. In total, 23 families received tailor-made packages, with various children clothing items, a bag and soap. Another beneficiary was Nora, a 32 year old unemployed immigrant from Togo, with one child. Since Nora isn’t trained, she either sits at home taking care of her child, or is looking for interested families, where she can help do the laundry or cook for some small payments. The probability that she could learn an income earning skill sparked some joy and hope to her face. Nora was registered for the training programmes and her child received a package.